New cushions for our sofa were on the agenda a few months ago. So of course that called for an exhaustive search to find something that inspired. I wouldn’t usually do this for a pillow but I wanted something a bit special. Well, I didn’t find any pillows for the sofa but I found plenty of options for my daughter’s bedroom – five impeccable options to be exact – all from UK designer Michelle Mason. 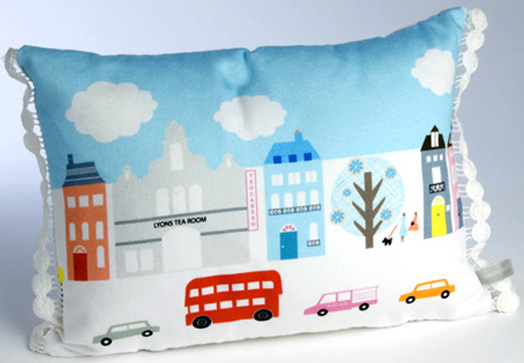 This new collection of cushions depicts modern and playful illustrations of life in London and Paris. They are full of colour that pops intertwined with lovely scenes of city life. The illustrations are firmly in the retrotastic category for me and would suit any child’s chamber. My favourite is the ‘Paris Cushion‘ (pictured top). 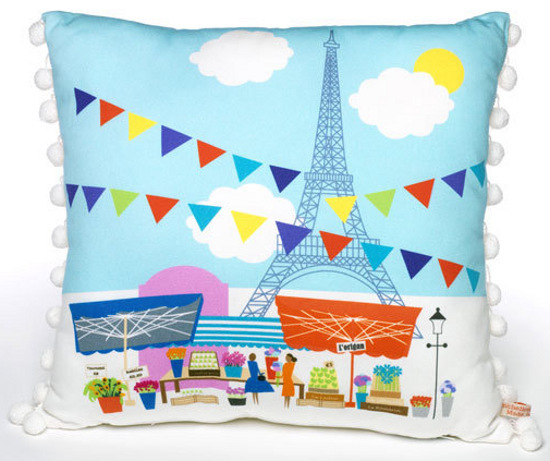 I adore the little pom-poms that adorn the edges and the bunting flying high with the Eiffel Tower. 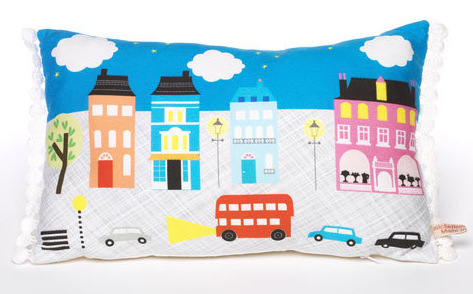 The ‘London Night Cushion‘ is also gorgeous with its iconic red double-decker bus under a starry night sky. Each digitally printed cushion is made from cotton satin and backed with calico. Head straight over to Michelle Mason to purchase with prices ranging from £45 to £50 and free delivery to Australia. Then revisit our feature last April on her wonderful rugs.